The side of an equilateral triangle, in feet, is . What is the height of this triangle? The height of a triangle will always cut one of the sides of an equilateral triangle in half. Now, to find the length of the height is just a matter of using the Pythagorean Theorem. The length of a side of an equilateral triangle is feet. In feet, what is the height of this triangle? Because the height of an equilateral triangle always cuts a side length in half, figuring out the height becomes a matter of applying the Pythagorean Theorem. The length of a side of an equilateral triangle is centimeters. In centimeters, what is the length of the height of this triangle? Since the height of an equilateral triangle will always cut one of the sides in half, find the height using the Pythagorean Theorem. The length of a side of an equilateral triangle is . Find the length of the height of this triangle. 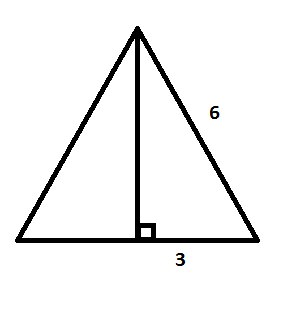 Draw out and label the triangle. Even though you are given exponents for the lengths of this triangle, use the Pythagorean Theorem to solve it. The height of an equilateral triangle will always cut one of its bases in half. Find the height of an equilateral triangle that has side lengths of . Since the height of an equilateral triangle will always cut its base in half, use the Pythagorean Theorem to find the height. Find the height of an equilateral triangle that has a side length of . Since the height of an equilateral triangle always cuts its base in half, use the Pythagorean Theorem to find the height of the triangle. Find the height of an equilateral triangle, in yards, that has side lengths of yards. Since the height of an equilateral triangle cuts the base in half, use the Pythagorean Theorem to find the height. An equilateral triangle has sides of length . 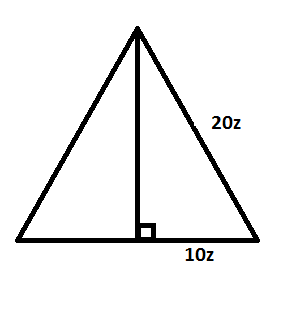 Find the measure of the height for this triangle. The height of an equilateral triangle will always cut the side it intersects in half. Now, this is just a matter of applying the Pythagorean Theorem.